A combined heat and power plant in Northern Ireland which could supply 25,000 homes will be the largest of its kind, it has been revealed. Two million tonnes of wood will be burned at the new ¬£81m Evermore plant in Londonderry, which will be the largest renewable energy project in Northern Ireland, investors said. The 15-megawatt installation is expected to begin operating in 2015 and will increase the amount of sustainable electricity generated in Northern Ireland by approximately a tenth. It is the first deal done in Northern Ireland by the UK‚Äôs Green Investment Bank, which is providing ¬£20m. He added that today‚Äôs investment will have a significant impact, reducing carbon emissions and diverting wood from landfill while creating jobs and building a stronger economy. Shaun Kingsbury, chief executive at the bank, said: ‚ÄúToday‚Äôs announcement will substantially increase Northern Ireland‚Äôs renewable energy capacity. Northern Ireland is striving to reach stringent renewable energy standards laid down by Europe ‚Äì by 2020 a fifth of supplies have to come from green sources. The Stormont administration has pledged a range of incentives including payments for businesses and homes using sources like solar, wind or woodburning biomass. Much biomass use so far has centred on micro-generation in homes and businesses. The wood-fuelled plant is to be built on a 10-acre site at the Londonderry Port and Harbour Commissioners land at Lisahally, developers said, and will simultaneously generate electricity and heat for homes. 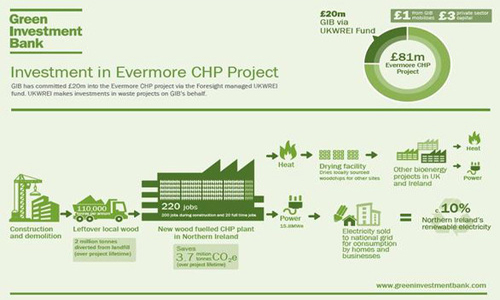 The flagship biomass unit is the first of its kind on the island of Ireland and also the first project to be developed and funded by Evermore, established by directors Ciaran and Stephen Devine. Ciaran Devine said: ‚ÄúWe are making a serious commitment to the Northern Ireland energy market. Working with the best partners in technology, fuel supply and financing we hope to show that Northern Ireland is a great place to do business so that further inward investment will follow. Evermore, advised by KPMG Corporate Finance Belfast, secured the funding from the Green Investment Bank through the Foresight Group‚Äôs UK Waste Resources and Energy Fund (UKWREI). Partner funders include GCP Infrastructure Fund Ltd, Burmeister & Wain Scandinavian Contractor A/S (BWSC), Investec Bank, and Eksport Kredit Fonden. Construction work on the plant will create 200 jobs and will start in the coming weeks. Evermore Renewable Energy expects the plant to become fully operational by summer 2015. Link to full published article here.